Nathan Jones: What about Revelation 18? Some people when they read "Babylon" they'll say that it is New York City, or it the United States as a whole. Is Babylon, which will be destroyed in an hour, be the nation of the United States? Dr. Reagan: It is. Almost every day I get a message from somebody saying it's got to be the United States because this chapter talks about a nation that controls the world and economy and everything, and so it has got to be the U.S.
Dr. Hitchcock: That's right. This view became even more popular after the events of 9/11 took place. There are several clues in the book of Revelation as to what this means. Revelation 17:18 tells us that Babylon is "the great city that rules over the kings of the earth." The verse tells us very clearly that it is a city. Now, what city is it? When you go back to the beginning of the passage it says that whatever this Babylon is, it is the mother of all harlotry and spiritual rebellion against God. Well, there is only one city that I know of that qualifies as the fountainhead of all of this, and it was Ancient Babylon. The book of Revelation is called the "Apocalypse" because it is the unveiling. It is not a hiding of truth. The word "Babylon" occurs about 300 times in the Bible. All the other times that Babylon occurs, with maybe one exception in 1 Peter 5, it refers to Ancient Babylon. It would seem very strange to me for the Bible to refer to Babylon over and over and over again as the literal Babylon and then we come to the very end of the Bible and all of a sudden it would change. Babylon is the most talked about topic in the book of Revelation. There are 44 of the 404 verses in the book of Revelation concerning Babylon, and so 11% of the book of Revelation is about Babylon. 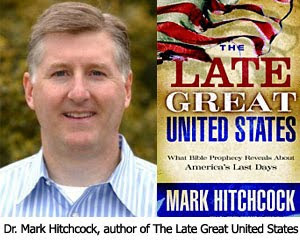 Dr. Hitchcock: Right, and Bible prophecy focuses on that part of the world as well. I take it as literal Babylon and others take it as Rome, but it is not going to be New York City or the United States. It just simply doesn't fit. Jeremiah 51:26: No stone shall be taken from you for a corner and no stone for a foundation, but you shall be a perpetual waste, says the Lord. - New Revised Standard Version. Babylon is fallen, is fallen... Not only is "fallen" repeated twice, but the phrase is repeated twice, Revelation 14:8, and Revelation 18:2. -- Why? God doesn't waste words [I think He's Conservative at heart...], and many Bible scholars believe that the repetition of "fallen" x2 means that it is the original Babylon that must be destroyed a 2nd, and final time that fulfills the utter desolation that is currently unfulfilled in the OT prophecies. I have seen a number of financial articles over the past few yrs where there are mega-bucks and construction projects that are flowing into that area at a frenzied pace... Who knows? I bought into the 2x theory back in the 70s... I almost got nudged outta my seat at 9-11, but it just doesn't seem to fit. PS. I forgot to mention -- no Fast-Fwd feature... That's only on God's master remote! Marylee said... "Media figure Joe Ortiz knows the answer."